Dr. Caleb Finch is the ARCO/William F. Kieschnick Professor in the Neurobiology of Aging and University Professor at the University of Southern California, Davis in the School of Gerontology. Dr. Finch’s major research interest is the study of basic mechanisms in human aging with a focus on inflammation. 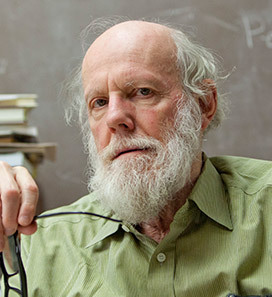 He has received most of the major awards in biomedical gerontology, including the Robert W. Kleemeier Award of the Gerontological Society of America in 1985, the Sandoz Premier Prize by the International Geriatric Association in 1995, and the Irving Wright Award of AFAR and the Research Award of AGE in 1999. He was the founder of the NIA-funded Alzheimer Disease Research Center in 1984 and currently serves as co-Director. Dr. Finch became a University Distinguished Professor in 1989, an honor held by sixteen other professors at USC who contribute to multiple fields. He is a member of five editorial boards and has written four books and 475 articles. A new research area is the effect of air pollution on brain development and aging, which he is developing through a USC-wide network (AirPollBrain).